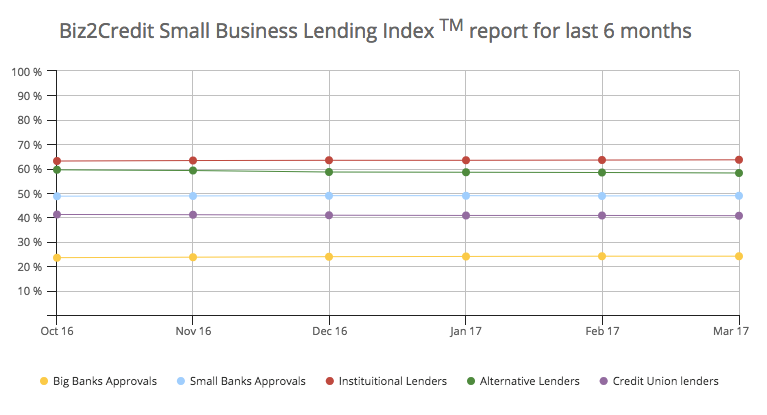 Trending: WordPress Zoho Corporation LinkedIn "What Is"
The latestBiz2Credt Small Business Lending Index shows a positive outlook for small business loans based on their approval rates. Specific upticks were measured at institutional lenders and small banks. Institutional investors and their lending counterparts reached a new high on the Biz2Credit index in March 2017. Current approval rates for small business loans came in at 63.6 percent — the third increase within the last four months. Small banks are showing they have faith in small businesses. Loan approval rates are creeping up to the elusive 50 percent mark, inching up to 48.9 percent. This one-tenth of a percent increase is a bump in the right direction compared to our previous highlight of Biz2Credit’s report. Small business loan approvals remained unchanged at the nations biggest banks. The 24.1 percent approval rate for March 2017 brings to a halt the increases seen for the past seven months. It’s important to note this is not an indication on the overall outlook of the economy and the small business landscape. 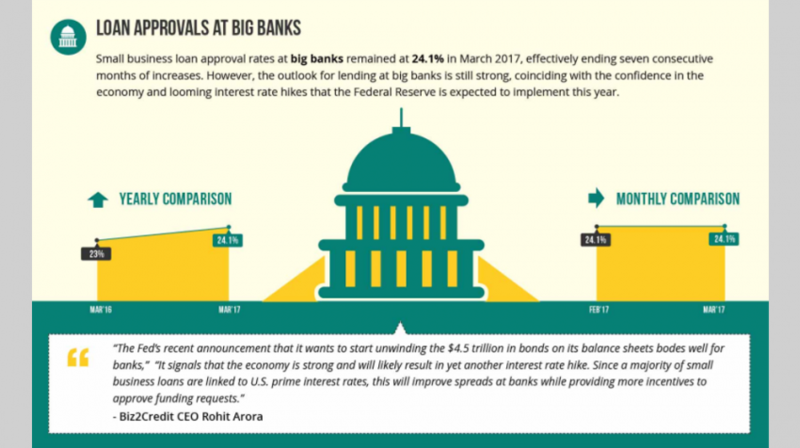 Big banks are optimistic about the economy as a whole, made evident by the Fed’s desire to “unwind the $4.5 trillion in bonds on its balance sheets,” as well as the possible rate hikes. “It signals that the economy is strong and will likely result in yet another interest rate hike. 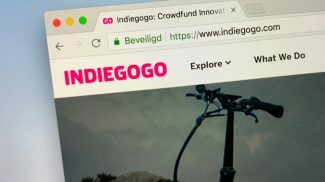 Since a majority of small business loans are linked to U.S. prime interest rates, this will improve spreads at banks while providing more incentives to approve funding requests,” said Arora. All in all the market is a positive one for small businesses with the remainder of 2017 progressing on an up note. 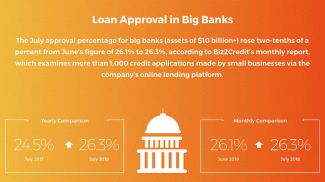 Biz2Credit’s March 2017 edition of its report analyzes the results of more than 1,000 small business loan applications.